Better Than A Heated Swimming Pool In Your Backyard | OhGizmo! You may be tired of waiting in extremely long lines for rides like Disney’s new Toy Story Mania. The long waits are especially annoying when the ride itself lasts only a minute. 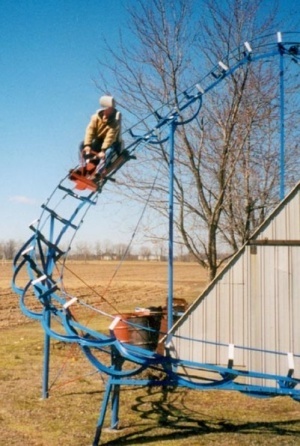 Well, if you have some spare time and a shed full of scrap metal you can do what John Ivers did and build a fully functioning roller coaster in your backyard. The ride is called Blue Flash and has 180 feet of track and a 360 degree loop. The ride is longer than the wait and you can pretty much go again and again until one of your relatives jumps on it while you are re-experiencing your lunch and hurling it into the trash bin. Video of the awesome ride after the jump. This is pretty old, but still, oh so awesome. The little girl who’s feet barely reached the bar freaked me out though. Yea, this is a pretty old video, but every time anyone shows it they never say if he tried running the car through with weights first versus doing it himself. I hope that before any inventor rode such gadgets they would send a dummy through first.